Both Viking men and women wore jewellery. The function of the richest jewellery was to clearly display wealth and status, as much as for decoration or to fasten to clothing. Viking jewellery developed into intricate and masterful artistry, with a strong preference for silver. 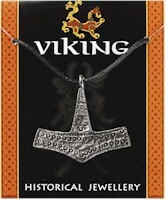 This Thors Hammer pendant is made from lead-free pewter and is supplied on a waxed cord. The information card is full colour with historical information on the reverse. Pewter seal of King John on a ring supplied in a clear blister on an information card that explains about the Magna Carta and its history. Pewter heraldic dragon pendant supplied on a silver chain. The information on the reverse of the fold-over card explains about heraldry and heraldic designs. Pewter Greek octopus supplied on a waxed cord. The information on the reverse of the card describes how Greek mythology appears on Greek jewellery designs and coinage. Wallet type packaging with a reproduction Penny held in a blister on the front. On the inside and reverse there is information about Richard I & King John.